Warning for Liptons, found two broken crab scoop nets with broken handles buried with broken pointy end sticking up , could be just a careless antisocial act or deliberate with malicious intent , obviously I have removed them. Koombana Bay, WA, AU Foiling action. I think I may have forgotten to go speed sailing today but enjoyed a cruise anyhow great fun towards the end of the session using Mikes channel between the alpha markers. Coodanup, WA, AU. FF113/GPS7.3/MUF21. A very enjoyable sail out with Mike, Ross, John and Barry. Speed runs throught the "weed channel", leaves Luderitz for dead!! Coodanup, WA, Fun in the sun .Enjoyed the smooth through the weed created by multiple runs through the alpha markers. Still managed to get the sack of the day. 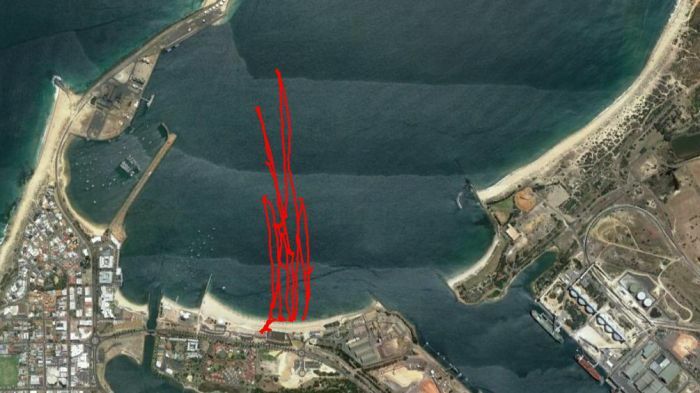 Awesome session at the Cococabana bay, Great to see a healthy Bunbury foiling crew. Ratz and Firie going great guns for newbees with some solid steady flights. Absolutely delightfull foiling blue water. Hui was playing tricks again, I had an 18kt average before I started to rig, but only a 15kt average after I'd finished, so started off a bit underdone on the 6.2, 53 and 20cm@55, but after a while it liftted a bit and for most of the time there after, was just nicely powered. As Johnski says the alpha markers channel is just heaps of fun, but I forced myself to head furthe upwind for a NM run on the edge of the weed. This was my fastest run, I managed to hook into a good gust for just over half of it, but a hole just after the start had me down to 20kts very briefly. I went back for another go, it didn't have the big dip, but neither did it have much speed either. We found a nice little clear spot to gybe in, with a channel in and a channel out, unfortunately a bit too close together, probably only 30m apart, so made it a bit hard getting back out with a lot of speed. AND! There was one weed burg right on the flip point. It wasn't big, but after I hit it and went over the handle bars mid gybe, I thought I warned every body, but Johnski did exactly the same thing a few runs later. Also found some weed with teeth, my stainless steel leading edge is now very serated. Its just off to the side of a narrow channel heading to the small gybe marker. So stay up from the gybe markers. Good fun sail today, with Stretch, Johnski, Fangy and Basil. I think I also spied Birdman playing close to the weed. It was better with a bit more water, could still have done with more though. Fangyland fun day out cruising around with the Stretch, Jonski, Cap’n Calm, Basil, and I think, a lonely Pinna, Birdman. My first inspection of the water at lunch had been pretty underwhelming, but Stretch turned up and brought some breeze with him, so I joined the Mobbers for a splash. Of course as soon as Cap’n Calm started rigging, it dropped off a few knots. That left me a bit short on horsepower for the arvo, but for the most part it was just a relaxing tour of the bay. A channel cut through the weed by someone/something ( I thought it was the Capn’s doing) made for some fun little squirts and even when I went off piste, my luck held, and I had no handlebar action, just the odd solid tug or two in the thick stuff. I saw the other guys have a crack at making dents in the estuary with more success, but I can’t say I felt left out. Top Ten Fangy Cocktail Cruising on the Barge sorta day. Thanks for the warning Hards, could have been tragic! Theres some ferals out there. A mighty fine bit of work then Stretch. Good job. It will be interesting to see how long it lasts, and whether we can keep it open.